Revolutionary recycling can save us from eco-extinction, argue the authors of a fascinating book about the planetary and human co-evolution. The revolutions described by the climate-change experts who wrote this fascinating book are extreme events that took place in response to sudden changes in temperature and atmospheric constitution. These crucial environmental changes were triggered by a transition that ‘bucked the trend’ and, against all odds brought life on Earth to where it is today. the origins of homo sapiens with their ability to communicate using language. The term ‘revolution’ is used to denote the political significance of the position that we find ourselves in today, where human beings have the chance to use their intelligence to make or break the future of our planet. The authors hail from the University of East Anglia where the climate change evidence that was challenged by sceptics at the Copenhagen conference, originated. This accounts for the technical and scientific nature of the central chapters, used to demonstrate the validity of the data upon which the arguments are based. Lenton and Watson are second and third generation students of James Lovelock, who popularised the concept of Gaia, a self-regulating planetary being. So the book begins in a very reader-friendly way by ‘inviting’ us to imagine we are present as the Earth goes through significant points in its formation and the evolution of life. 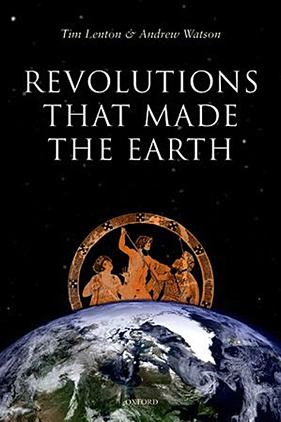 The authors choose to examine the pre-conscious revolutions to show what lessons can be learnt from them, when previous ‘near catastrophes’ turned out all right in the end, due to our amazing planet’s ‘Earth Systems’ where life intersects with its environment. Revolutions are cyclical changes, in which a new organism evolves that tips the balance; for instance by splitting water molecules into hydrogen and oxygen, leading to a gradual build-up of oxygen in the atmosphere to unprecedented levels, that caused global cooling. The resulting ‘snowball earth’ encouraged the evolution of other micro-organisms that released carbon-dioxide, warming the earth and opening the way for the colonisation of the land by lichens, that combined fungal portions that released phosphorous and other elements from the rocks, with plant portions ( in a symbiotic relationship) that could use the energy from the sun to combine these with carbon from carbon dioxide in the atmosphere, releasing oxygen for the newly evolving mobile creatures who needed it to breathe. This is a somewhat simplified version of the very complex process that unfolded over the billions of years that our planet has been changing as a living whole, in which everything, from rocks to the atmosphere, is interconnected. Since all the elements of this system are finite, the biggest lesson we need to learn from this is that our continued existence depends on the efficiency with which they are recycled. Up until now there has been a balance between the various parts of the system, as one organism’s waste becomes another’s food. But our present crisis resulting from the exponential rise in burning fossil fuels in the capitalist system’s obsession with growth, has set off a ‘runaway’ positive feedback. This, the authors argue, can only be balanced by a revolutionary change in the way we behave, including recycling waste through ‘carbon capture and storage’. At present the industrial pollutants that are damaging the rivers and oceans, is leading to the replacement of the creatures we depend on for our food with algae and jellyfish that can tolerate these conditions. Watson and Lenton conclude with a look into the future, inviting the reader to consider which of three possible scenarios that we could choose as ‘observers’ and potential ‘friends of Gaia’. The first is to continue on the path that we are on (or ‘burn baby burn’ as they call it!) which will lead to the melting of the ice caps, which reflect back some of the sun’s heat. This in turn will lead to huge climatic changes and loss of land beneath the deepening waters. The second scenario is the one predicted by those who advocate reversion to a simpler way of living as well as entirely local production of food. Detractors argue that this would deny many of the technological advances made in recent years as well as putting globalisation into reverse. This approach is rejected by the authors as being too negative to work unless it was enforced. The real revolutionary answer according to them is to continue to use our innovation and imagination to build a world using alternative sources of energy to fossil fuels, by developing unlimited solar and nuclear power on the one hand; and recycling everything so that it doesn’t pollute or run out. This would be drawing on the lessons from Gaia’s earlier revolutions that included three critical processes: finding alternative sources of energy, recycling scarce resources and enhancing the transmission of information. The difficulties that would need to be overcome include a change in relationship with the earth’s natural resources, which must be valued and protected as the ‘global commons’ belonging to everyone. The other problem with this proposition (that is very much in the news at present) is the danger of radiation from nuclear power plants that can be damaged by natural causes, such as the huge earthquake in Japan. This is another issue that makes this book so relevant at the moment, for not only are we experiencing political revolutions in northern Africa, but the planet is demonstrating the power of earthquakes and tsunamis to challenge the most advanced societies and their technologies. Whether we agree with all their conclusions or not, this book is a stimulating read that involves its audience and challenges us to enlarge our awareness of many branches of human knowledge. It embraces the ethical question of how we can overcome our ‘selfish genes’ to co-operate with our fellow human beings and recognise our symbiotic relationship with the Earth ecosystem that sustains us. At this critical phase we need to have the willingness to take effective action, to supplement our ability to predict the outcomes of failing to take action.